Islam's ideals are manifold and they are clear; but how do they work in practice, how fully have adherents implemented them? ... a distinction must be drawn between private and public precepts. 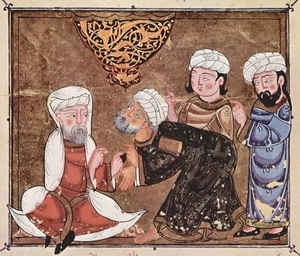 Premodern Muslims generally considered themselves successful at living in accordance with regulations concerning private life. Vastly disparate peoples around the world adopted stringent Shar'i restrictions, even where these conflicted with their own inherited customs. Polytheists became monotheists, monogamists became polygamists, matrilocals became patrilocals, matrilineals became patrilineals, cow-worshippers became beefeaters, bride prices replaced dowries, and fruit juices replaced alcohol. A qadi (Shar'i judge) listens to a petitioner. Local customs rarely gave way entirely, but Muslim peoples did come widely to share Islamic practices such as marriage customs, holiday celebrations, and butchering techniques. Shar'i customs fulfilled less well were usually the less personal, for example, the ban on interest fees or the dividing of inheritance shares. The success of precepts regulating the private sphere added greatly to Islam's hold over individual believers. As a result, the appeal of Islam lay largely in [what Patricia Crone and Michael Cook call] "the world of men in their families"; by satisfying personal needs, the sacred law became closely identified with a whole way of life. We can distinguish three different kinds of legal subject-matter ... according to the degree to which the ideal theory of the shari'a succeeded in imposing itself on the practice. Its hold was strongest on the law of family (marriage, divorce, maintenance, &c.), of inheritance, and of pious foundations (wakf); it was weakest, and in some respects even non-existent, on penal law, taxation, constitutional law, and the law of war; and the law of contracts and obligations stands in the middle. Non-implementation of the Shari'a confronted Muslim peoples with a choice of two responses, one conservative, the other radical: they could acknowledge human foibles, resign themselves to the imperfect circumstances in which they lived, and accept the status quo; or they could struggle relentlessly to suppress these failings, align Muslim society with Islamic ideals, and create a Shar'i utopia. Because the latter option meant rising up against existing governments and violently overthrowing them, bringing massive unrest and possibly destroying the Islamic way of life, Muslims rarely took this route, more often preferring to accept things as they were. Through most of Muslim history, the urge to rebel against unrighteous governments was rejected in the interests of avoiding fitna. [As H.A.R. Gibb explains,] "So long as the secular governments did not interfere with the social institutions of Islam and formally recognized the Shari'a, the conscience of believers was not outraged and the task of building up a stable and universal Muslim society could go on." A balance between Shar'i goals and human realities emerged; this is what I call the medieval synthesis, an immensely stable and attractive combination of ideal goals and pragmatic actions which held in several continents and over many centuries. This willingness to accept imperfect conditions will be referred to as traditionalist Islam. Traditionalists were Muslims who, finding the medieval synthesis satisfactory, did not attempt to implement the sacred law in its entirety. For them, the preservation of Muslim society took precedence over complete implementation of the law. They did pressure for improvements, but in careful, gradual ways, making sure not to ruin a tolerable situation in the pursuit of a better one. 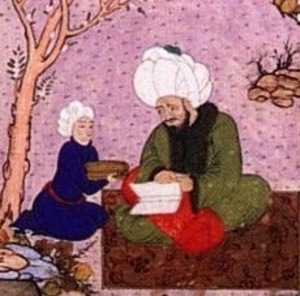 An Ottoman member of the 'ulama' with a student. At the heart of the traditionalist attitude lay the willingness of the 'ulama, keepers of the sacred law, to abide by partial implementation. They made the gap between ideal and reality more tolerable by condoning minimalist interpretations of the Muslim duties and bending the law when it was not applicable. The ban on interest between Muslims was clearly impractical; with the approval of the 'ulama, Muslims circumvented it by resorting to legal tricks which permitted interest payments while fulfilling the letter of the law. On the public level too, no serious attempt was made to effect the Qur'anic or Hadith doctrines in their entirety. Muslims came to terms with the fact that many kings ruled, not one caliph; that the umma was irrevocably split; that Shar'i-sanctioned taxes did not suffice; and so forth. The scriptures may have "a strong tendency to put the collectivity above the individual and to treat individual believers as equals," [Elie Kedourie notes,] but "these tendencies have not usually had political or economic consequences in traditional Islam." Specifically with regard to wealth, "no serious, sustained attempt was made to translate the Brotherhood of Believers into economic terms." Successive jurists made [sundry] accommodations with a deteriorating reality, until finally the whole system of juristic constitutional theory was tacitly abandoned, and a new approach devised, based on the principle that any effective authority, however obtained and however exercised, was better than unrestrained private violence. "Tyranny is better than anarchy," became a favourite theme of the jurists. This eventually became the prevailing attitude of Muslim subjects toward their governments. Among Muslims living in Dar al-Harb, similar realistic attitudes developed and they endured kafir rule far more often than they rebelled. Non-implementation became so universal that the more a Muslim appreciated the sacred law per se, the less he expected it to be applied. According to Snouck Hurgronje, "all classes of the Muslim community have exhibited in practice an indifference to the sacred law in all its fulness, quite equal to the reverence with which they regard it in theory." Knowledgeable about the law as they were, the 'ulama were "the last to contradict" the general awareness that the Shari'a had "never been put in practice"; instead, they emphasized "the fact that the laws expounded by them are only fitted for a better society than that of their contemporaries" and relegated the fully Shar'i society to the remote future. Discussions about the law "are full of sighs of despair over the ever-wider cleavage between ideal and reality," yet the Muslim legal experts accepted this condition as normal and natural. Acceptance of the medieval synthesis meant that Muslim peoples, whether in Dar al-Islam or Dar al-Harb, usually submitted to the control of existing governments, however deficient these might be from a Shar'i viewpoint. As Shar'i goals were subordinated to the need for stability, obedience to the political authorities became the norm and preservation of the status quo became an end in itself, creating an overwhelmingly conservative political environment. July 1, 2013 update: I consider the current role of the medieval synthesis at "Can Islam Be Reformed?," in the July/August issue of Commentary.